Who needs a Pleasure Craft Operator Card (PCOC)? 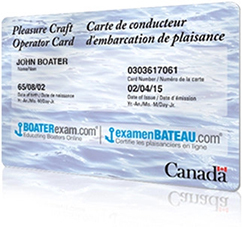 All operators of recreational powered watercraft in Canada regardless of age, engine horsepower or length of boat are required to have the Pleasure Craft Operator Card (PCOC). All boating safety courses and tests leading to the issuance of a PCOC are delivered by course providers accredited by Transport Canada. You can view the list of accredited course providers online or by calling the Boating Safety Infoline at 1-800-267-6687 to request that the list be mailed to you.